"I have no reason left to live." 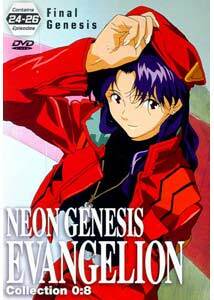 When it originally debuted in Japan, Neon Genesis Evangelion was a huge success. Many of its themes were revolutionary for the format, and on the artistic end, (especially the mecha designs) the show was considered a new benchmark. Audience expectation for a slam-bang series finale was at an all-time high when the last two episodes hit: unconventional, non-linear, and beguiling, they angered many, who felt that the plot hadn't been wrapped up satisfactorily. I can certainly see merit in these comments. It took me several viewings to even formulate an opinion on the intent of the ending, and as I write this review, I am stumped as to the best way to present the material. Let me preface by saying that this final disc is a must for collectors of this series (or anime in general). It might not be a conventional ending, but it is an effective one. Collection 0:8 contains episodes 24-26 of this 26-episode series. The final "normal" episode of the series is the most effective of them all. This is probably the best example of the series firing on all cylinders�amazing action sequences, deft character interaction, and the complex psychological interludes that have peppered the series' previous episodes are all on display here. Shinji is still reeling from the revelation at the end of episode 23 when he encounters Kaoru, the Fifth Child, brought in to replace the addled Asuka. Kaoru and Shinji have an instant, spiritual, intimate connection. The emotionally closed off Shinji feels a more intense bond with this boy than with any other human he has ever met. Kaoru says, "I think I was born to meet you", and Shinji believes it. But it's all about the pain in this series, and to save the world (again), Shinji is forced to act once more, this time, most painfully of all. I decided to break my "episode synopsis" format for these final episodes and just offer an interpretation. I may reveal things that could be perceived as **spoilers**, so proceed with caution. Following my initial viewing of these episodes, I was dumbfounded. A show I had always found very complex and confusing, full of allegory and hidden meaning, had thrown me yet another curveball. I'd just finished viewing 45 minutes of inner monologue�a psychic voyage into the intermingled minds of all the Eva characters. The sometimes shockingly simplistic animation is a surprise, as is the use of photomontage—out of place in an animated show. I had no idea how to begin to interpret what I'd just seen (I didn't even understand it on a simple plot level, let alone an allegorical one). I proceeded to search the Internet. I was amazed at what I found�an entire network of sites built to delve into some of the questions I found myself asking. I didn't want someone to give me answers (and I suspect the ultimate meaning will be slightly different for everyone). It was enough that I found a bit of an outline to the series, and an explanation of all the buried Biblical references and psychological overtones. It all comes down to this: the much referred to "human instrumentality project" was a plan to reduce humanity to its basic, genetic state, a sort of scientific version of the Flood. Viewing the last two episodes with the understanding that this is why Shinji seems to be interacting with others, with no sense of logic or realism helped quite a bit. Apparently his mind actually is melding with those of the others. In this context, I enjoyed what was done with the finale quite a bit more, as it seems the logical conclusion to the storyline for Shinji, who has always been our "eyes" through which to view the events and characters. Shinji has always felt closed off. He hates his father, has never known his mother, and cannot accept praise or friendship from others. The final two episodes are basically an intervention, as the minds of the other characters try to convince Shinji that human interaction is essential to humanity. And, it turns out, all Shinji wanted was to be liked. So, that's it. The end to my favorite anime series, and what a way to go. Confusing, but certainly in the spirit of the show, this final disc is essential viewing for all anime fans. As a post-script, there was an Evangelion movie produced after the show ended. Manga will release it on DVD in the U.S. later this year. The movie is still unconventional, but it more clearly outlines what actually happened. Of course, I think the film ending totally contradicts the show ending, but don't get me started. Image Transfer Review: Video quality is on par with the last several discs, but overall, this one is just a bit weaker than Collection 0:7, owing mostly to the condition of the source materials. Overall, the colors look strong, and there is no obvious digital artifacting. The black level is solid, and fine detail looks good. The finals episodes feature varying styles of animation, from still photos to hand-drawn, and all seem to be represented faithfully. However, this final disc contains many, many quick cuts between images, and the clarity of the DVD format really exhibits how sloppy some of these edits are. Through no fault of ADV, the framing of the image noticeably jumps quite often. The effect isn't as annoying as it may seem, but it is worth mentioning. Audio Transfer Review: The audio transfer this time is a bit less flashy than previous volumes, but it suits the material well. The first episode features a more traditional action mix, with the same clear but rather narrow soundstage I've come to expect from these releases. The score and sound effects are well mixed in the mains to provide an appropriate, if not dynamic, aural experience. However, the final two episodes are almost all dialogue, with hardly any score and few sound effects. For these episodes, almost everything is confined to the center channel. Everything is still audible, though, and the stylistic departure of the audio matches the changes in the animation quite well. Extras Review: As with all previous discs in this series (with this, my fifth review, I really feel like a broken record), the disc includes no extras outside of brief character bios and support for multiple dubbed tracks. In retrospect, some information on the making of this landmark series would have been appreciated. Even a discussion with the creator, explaining some of the themes and meanings, would have been enough. Alas, it was not to be so. Perhaps the fall release of the Evangelion films will feature more in the way of supplemental materials. I can't recommend Evangelion Collection 0:8 without also urging a purchase of the entire series (perhaps one of the most influential of all time). Many have expressed a strong dislike for the shifts in tone throughout the series, and the jarring, dense, final episodes so beguiled audiences that a feature film was produced to answer their questions. I believe, however, that the ending presented here fully matches the spirit and intent of the series as a whole; it's just that the meaning might not become clear until the second or third time you watch. Whether you are an anime beginner or a die-hard fan, this series will, if nothing else, give your brain a workout. All eight discs, highly recommended. Come on, it's only money!